During the annual holy pilgrimage of Kumbh, Geometry Encompass and Hindustan Unilever came together to address the issue of sanitation. Kumbh Mela is one of the largest congregations of people in the world – where over 150 million devotees come together to wash off their sins; elevate their consciousness at the confluence of the famed trinity of rivers – Yamuna, Ganga, and Saraswati. However, this congregation finds sanitation to be one of the key problems faced by both organisers as well as devotees. 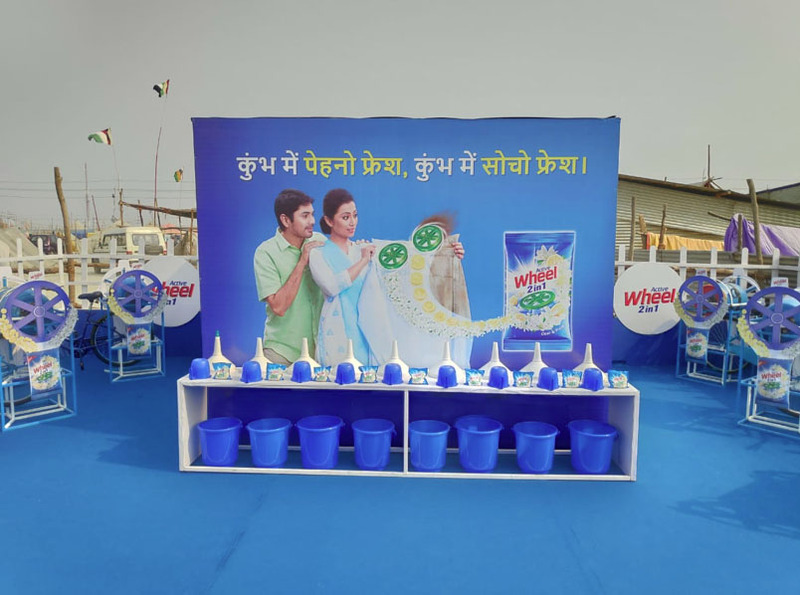 Geometry Encompass conceptualised and created four campaigns for Hindustan Unilever’s home and personal care brands, namely Active Wheel, Lifebuoy, and Vim. One aspect unique to the Kumbh is Kalpavas – a 30-day period of living in austerity and following a fixed schedule to transform the inner consciousness, witnessed by over 20 lakh people living in tented cities. It was a big challenge for these Kalpvasis to wear fresh clothes every day. Taking stock of the situation, Active Wheel, which strongly believes in the concept of ‘Pehno Fresh and Socho Fresh,’ wanted devotees to Think Fresh, by Wearing Fresh. Thus, Geometry Encompass facilitated a unique ‘Wheel Wash-o-Cycle’ – a drum attached to a bicycle, which rotated on pedalling the cycle, recreating the function of a washing machine. Devotees simply had to fill the drum with water, add their clothes, sprinkle Active Wheel detergent powder, and pedal for 10-12 minutes, to enjoy fresh, clean clothes, free of cost. Two such Wheel Wash Stations were set up at the Kalpavasi tent city, each with more than 20 installations of ‘Wheel Wash-o-Cycle’, which use no electricity, save water, and can be easily used by anyone. Active Wheel also ensured an adequate supply of clean water and drainage systems in place. Through this, over 30,000 devotees were able to enjoy the comfort of fresh clothes during the Kumbh Mela. 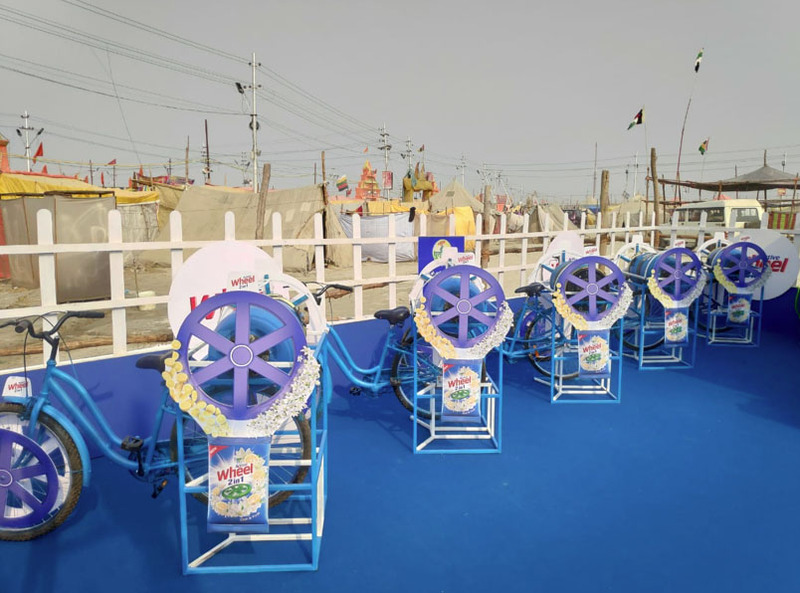 The brand has decided to donate the Wheel Wash-o-Cycles to nearby villages, post Kumbh, thereby continuing to make a difference in people’s lives. Active Wheel will also train the villagers to make the machine themselves, thus reducing the effort needed for manually washing clothes and empowering women to realise their ‘Fresh Soch’. By these efforts, Wheel hopes to help women realise their own dreams and entrepreneurial aspirations, and even earn revenue that they can help their families with. 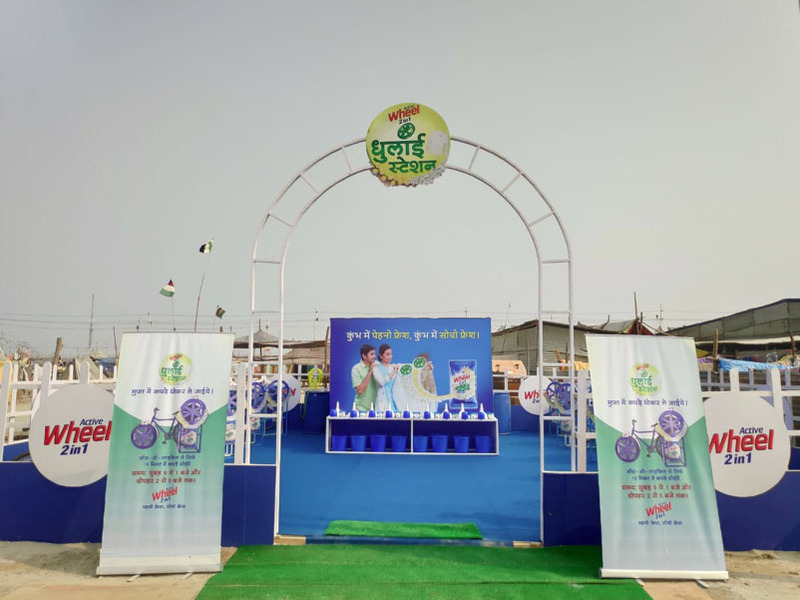 Geometry Encompass took the agenda of ensuring sanitation at the Kumbh Mela a step further when they worked with Lifebuoy and conceptualised two innovative campaigns to remind devotees to wash their hands after using the restroom as well as before eating their meals. In the first campaign, they developed an innovative ink after 3 months of rigorous research and testing. The ink was developed into a stamp which becomes an active reminder to wash hands. A visual red stamp was marked by over 150 Lifebuoy representatives who stamped 10,000 hands per day. As the devotees put their hands under a tap, the stamp lathered into soap and helped provide superior germ protection, ensuring a hygienic stay at the Kumbh. As a result, there were several attendees who approached promoters to have their hands re-stamped for later, and used a total of 3 lakh stamps to wash 6 lakh hands over the 30 days activity. Taking it one notch higher, Geometry Encompass and Lifebuoy distributed thalis, which were engraved with a message – ‘Kripaya pehle sabun se haath dhoyein’ (please wash your hands with soap first). The Lifebuoy branding was a part of the thalis which were distributed at meal centres, to be washed and reused, effectively delivering the message to millions of visitors. Lifebuoy also addressed the issue of washing one’s hands after visiting the washroom by stamping the hands of those using public restrooms with an ink that had a layer of soap on it. The ink dissolved on contact with water, ensuring their hands were washed thoroughly. Geometry Encompass also highlighted the efficacy of Vim dishwashing soap by replacing mirrors in public restrooms with thalis washed with the brand. The plates were so clean and shiny that the reflective surfaces acted like mirrors.